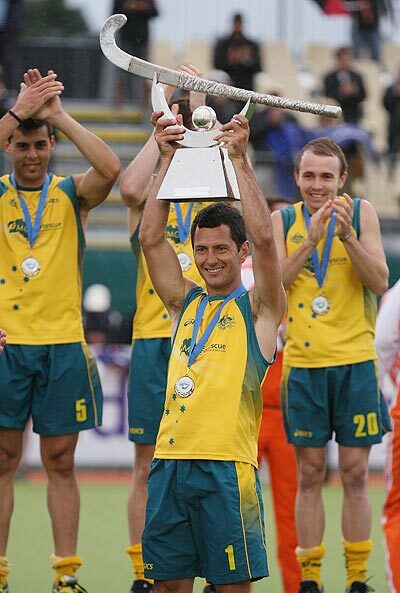 Australia have made history by becoming the first team to win four FIH Champions Trophy tournaments in succession following a 1-0 win over Spain in the Gold medal game of the Owen G Glenn FIH Champions Trophy, on Sunday. Eddie Ockenden scored the solitary goal as he forced home a penalty corner rebound eleven minutes from the end of the game. Thus, giving the mighty Kookaburras a stunning success in Auckland. The Netherlands bagged the Bronze medal after defeating New Zealand 5-3 in an epic clash. A remarkable encounter ebbed and flowed before the Dutchmen finally broke free of their resilient opponents with goals in the 67th and 69thminutes from Bob de Voogd and Billy Bakker respectively. Netherlands legend Teun de Nooijer, who netted a goal in the victory, made him the all time record holder in terms of Champions Trophy medals. The 35-year-old playmaker now has 13 medals in his collection, moving him ahead of former team-mate Jeroen Delmee. The result also ensured that the Netherlands moved into the record books, as they have now won more bronze medals than any other team in Champions Trophy history with seven. Although it was a disappointing day for New Zealand as they equaled their best ever Champions Trophy finish of fourth place. Germany have booked their place at the 2012 Champions Trophy tournament by achieving a fifth place finish. The European Champions defeated Great Britain 1-0, with Thilo Stralkowski netting the only goal of the game with a 30th minute penalty corner. Earlier in the day, Pakistan claimed seventh place by defeating Korea 5-4 through a golden goal from Muhammad Rizwan Senior. It was Pakistan's second win against Korea at the tournament, having beaten their Asian rivals 6-2 earlier in the week.